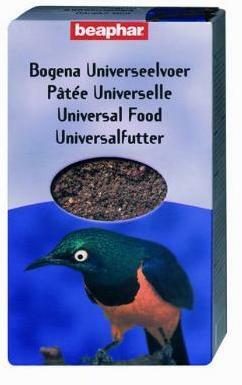 Beaphar Bogena Universal Food is a softbill food ideal for mynahs, tanagers, Peking robins, bulbuls, foreign starlings, magpies, jays, thrushes and blackbirds. Universal is a brown granular product made from whole and crushed berries, dried insects, freshwater shrimps and crushed seeds. Enriched with proteins, fats, vitamins and minerals blended with honey for maximum palatability.